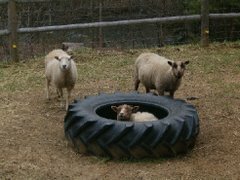 Hi, my name is Maybelle Sabrina and I'm a white Shetland Sheep. Today was my day to shine. It's now official, I'm a MOM! I gave birth to a healthy ewe lamb at 9:21 a.m. Shepherdess mom was patiently waiting for me to give her another wonderful baby and I did a good job. Shepherdess mom was coaching me through my labor. Here's some shots of my sweet little baby girl. She's white, just like me! Here's a few pictures of the lambs. 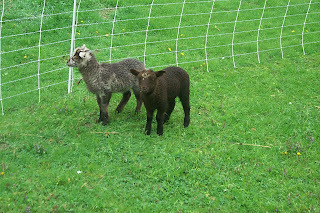 The one below is Belja (musket blettet ram lamb with possible scurs) on the left and #7 (black krunet ewe lamb) on the right. They are from Mulan and Wilkins. 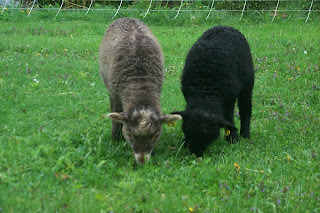 This is a picture of Flik (musket blettet/flecket ram lamb) on the left and #9 (moorit or musket ewe lamb) on the right. They are from Sassy Too and Wilkins. 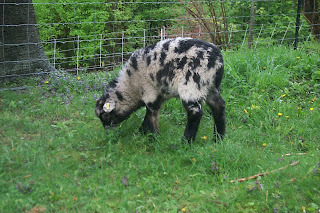 This is a picture of Bergelmir (gre blettet/flecket ram lamb) from Sylph and Wilkins. 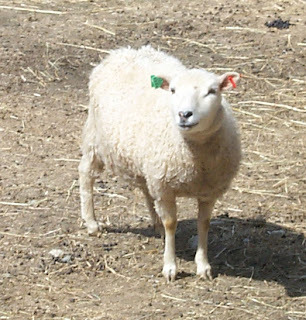 This is a picture of #11 (moorit or musket ram lamb) from Celebrian and Wilkins. The second round of lambing will be starting shortly. Keep posted for more lambs. Hi all, my name is Sabbath Farm Celebrian and I'm a moorit Shetland ewe. 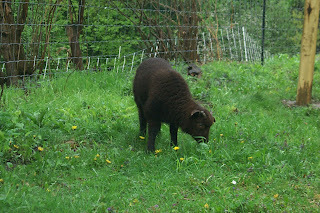 Moorit is a nice chocolatey brown color. I surprised shepherd dad with a ram lamb in the field when he got home. He had to do some quick work to get a lambing jug ready, so he evicted Sassy Too out of hers and cleaned it up. That is right, I don't want to be having MY baby walking around in the same straw and hay that Sassy did. If you look at the picture below, you'll see the little cutie. He weighed in at 7 pounds. I know that Sylph wanted a post next of her ram lamb's "cute" face, but you can't beat a face with no spots. Dear me, what a horrible thing to happen to a lamb! Mine is perfect with just a few white hairs on the top of his head. I blame that white completely on his father. I can't control everything, can I? Well, enough of this, here's a picture of him (I think the s.m and s.d are calling him #11 or some such). Bringing in May in style! I'll try to get shepherdess mom to take a better picture of his adorable face. She thinks I'm a great mom as I did well lambing him and have been very attentive to his needs.